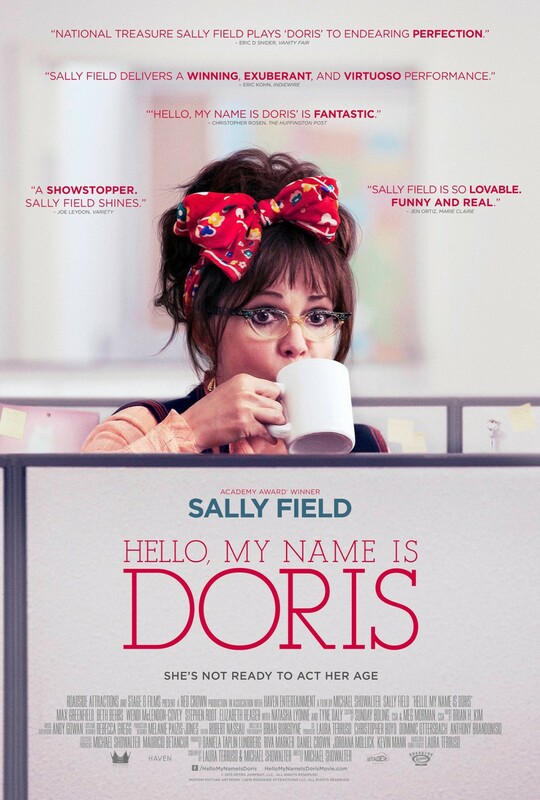 Movie: "Hello, My Name is Doris"
Doris Miller (Sally Field) is an aging hoarder who, after the death of her mother, is under pressure from her brother Todd (Stephen Root) and his wife Cynthia (Wendi McLendon-Covey) to move out of their family home. In midst of dealing with this psychological and emotional blow, Doris develops a crush on the much younger new guy at work named John (Max Greenfield). After learning and adopting his interests after some mild internet stalking, Doris finds herself surrounded by a new group of young, hip friends. However, her old friend Roz (Tyne Daly) is worried Doris is setting herself up for heartbreak. CHOO-CHOO!! All aboard the Sally Field Best Actress Oscar train!! CHOO-CHOOOOOOOO!! "Hello, My Name is Doris" is an off-beat comedy drama directed by Michael Showalter about an older woman's romantic obsession with a much younger man. Sally Field stars as Doris Miller, a woman who many may describe as a spinster or an old cat lady. Doris has spent the vast majority of her life taking care of her sick mother, sacrificing any personal life of her own to do so. The film opens at her mother's funeral, and we quickly learn both Doris and her mother are and were hoarders. Feeling a bit lost with her mother gone, for the first time, Doris is allowed to finally have a life of her own. And wouldn't you know it, on her first day back at work, a young man named John, played by Max Greenfield, has just transferred from the company's Los Angeles office to a permanent spot in New York. John and Doris have a close encounter in an elevator, which sparks up a conversation between the two of them, and from that point on, she becomes obsessed with him. Hilarity, sadness, and second-hand embarrassment ensue from there. Sally Field is, quite frankly, a national treasure. Much to the chagrin of some, she has a natural charm that is vibrant and impressionable on screen. She hasn't really been around the acting scene much lately, and this movie is exactly what we needed to get reacquainted with her. Field is phenomenal as Doris, and she puts on a performance we would describe as Oscar worthy. Hopefully, the Academy remembers her come next February. She has so many great, funny moments with this awkward yet deeply layered character. We know Field is an ace when it comes to flexing her dramatic chops, too, and she gets to show us this dramatic side in scenes dealing with her hoarding, or her brother, or with her emotions about her mother's death, or when she finds herself backed into a corner with John, played by one of the stars of "New Girl," the delightfully funny Max Greenfield. John is painfully oblivious to Doris's crush, who in mistaking friendly conversation for a romantic interest, bites off more than she can chew as she is forced to learn how to Facebook stalk, listen to electronic music, attend concerts past 9 pm, and learn to live in a world where her vintage style is chic again. John, even as he's unaware of her true feelings, strikes up an unlikely friendship with Doris while remaining completely ignorant to her affections towards him. Field and Greenfield have many great, fun scenes together, some of which are fantasy sequences from Doris' mind about what she wishes would happen between the two of them, leading to more awkward real life encounters. 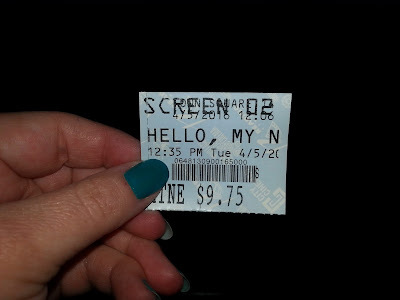 Anchored by a standout performance by Sally Field and a strong supporting cast featuring Stephen Root, Beth Behrs, Wendi McLendon-Covey, Tyne Daly, Isabella Acres, Peter Gallagher, Kumail Nanjiani, and Elizabeth Reaser, "Hello, My Name is Doris" is both quirky and charmingly sweet. It also has a lot to say about growing old in a cultural climate that both turns it's back on the elderly and strangely appropriates the vintage aspects of age. It's hard to pick our absolute favorite moment because there are so many wonderful parts, we lost count about halfway through its run time. This film made us laugh, it made us cry, it made us want to stand up in cheer, it made us cringe at its awkwardness, it the entire audience full of people seemed to enjoy it just as much as we did, which certainly helped the experience. 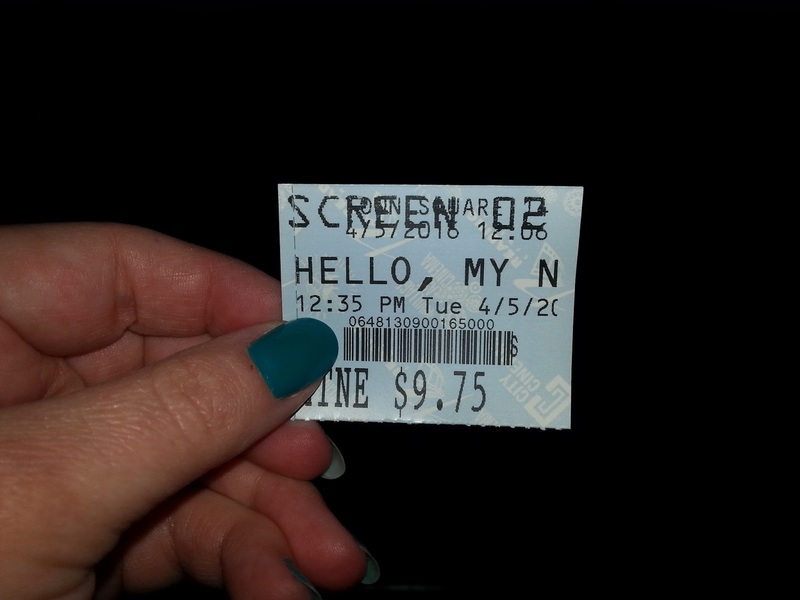 We left the theater with the great feeling of having experienced something truly joyful. What more can one really ask for!? One year ago, we were watching: "The Longest Ride"